Julie's home was a sheer joy to visit. An absolutely adorable older ranch style home located downtown. She has artfully incorporated architectural elements throughout her home to add interest and reflect her personal love for vintage homes. 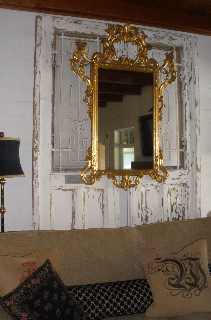 In her living room a beautiful gold mirror is hung on a pair of chippy doors behind a neutral couch. "Flert" pillows are placed on the couch lending a personal touch. Gorgeous white coral adds texture to this fabulous vignette. A large sculpture adorned with a coral crown brings a fantastic life element into the mix. Glass apothecary jars add sparkle and are a great way to display her collections. All this in front of yet another wonderful architectural element. Who would not want to sip coffee in this comfy little nook? Again Julie has added magnificent stain glass doors as a back drop to this darling seating arrangement. The warm toned wood adds comfort to the space. Traditional fabrics in black and white play off the whimsical checked floor. Love Love Love this room. Julie collects vintage white pottery. Here against the wood the pottery comes to life and showcases it's simple elegance. Selected art in muted tones adds movement and a small hint of color bringing the white and wood tones into a cohesive balance. Julie's home is truly a beautiful place. A brilliant mixture of architectural element, vintage collections and tradition. You have only one week left for you to enter the Romancing the Home Contest. I look forward to taking a peek into your home. Wow, I love this home. 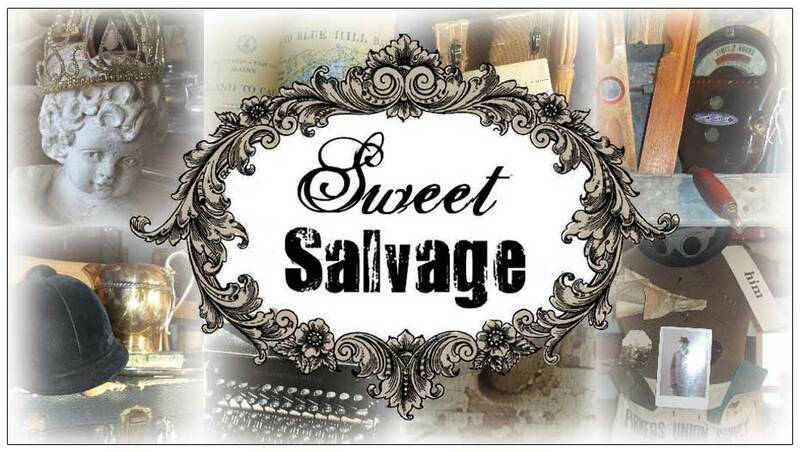 Julie's Architectural Salvage Elements are to die for! Gorgeous!